In 1984, the South Carolina legislature named the Boykin spaniel the official state dog. At that time, the breed had been in existence for about 75 years, developing a reputation as a field hunting dog par excellence. The official registry for the breed started in 1977. In 2009, the Boykin spaniel was fully recognized by the American Kennel Club. This handsome, medium-sized, good-natured canine also makes a fine family pet and athlete. This is a southern-bred dog,so big water in colder climes like the Chesapeake Bay and north are not appropriate for this breed when used as a duck hunting dog unless the dog's coat is weather conditioned and has a neoprene jacket available. Originally bred to hunt wild turkey, the Boykin spaniel is also found accompanying duck or dove hunters, along with those hunting upland game, such as pheasants. Smaller than most other hunting breeds, the Boykin's size allows him to fit comfortably in small waterfowl hunting boats without upsetting them. In the field, his brown coat provides natural camouflage when out with pheasant and turkey hunters. Boykin spaniels feature coats of various brown shades. The American Kennel Club breed standard allows rich brown, liver or a dark chocolate shade. While a Boykin might have a patch of white on the chest or toes, that's it as far as markings. They make excellent upland hunters that naturally quarter and flush game within gun range. Boykins spaniels get along well with other dogs, and are generally good with cats. Most Boykins are smart, friendly and full of energy, so they make fine companions for older children who also have energy to burn. 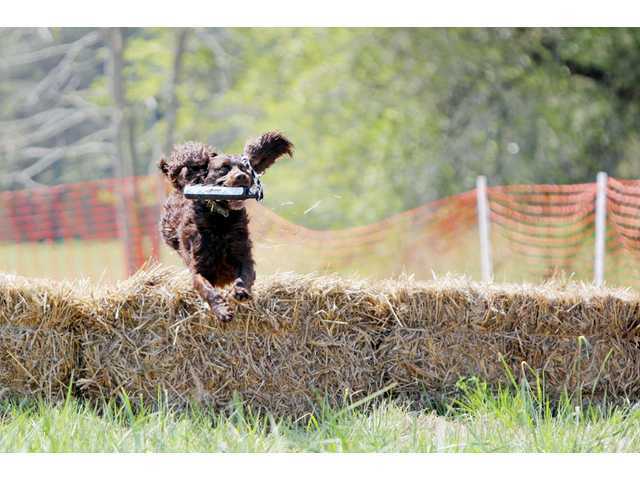 Besides hunting, you can channel that Boykin spaniel energy into other canine activities, such as agility, flyball and anything to do with water.